2 - 3,4..........Bingo von Ellendonk. 2 - 3,4..........Cona von Niederkassel. 3 - 4,5..........Jago von Beelen. 3 - 4,5..........Palma von Ellendonk. 3 - 4,5..........Blanka von der Au. 1997: 93-94-92 = 279 points (4th). 1996: 98-98-95 = 291 points (1st). 1996: 95-88-88 = 271 points (54th). 1993: 99-92-90 = 281 (8th). 1995: 97-80-84 = 261 points (6th). 1994: 98-92-96 = 286 points (6th). 25/03/1995: 100-95-96 = 291 points. 19/08/1995: 94-70-91 = 255 points. 02/09/1995: 97-93-94 = 284 points. 21/10/1995: 87-88-87 = 262 points. Kleo von der Weyermühle was the winner of the working IDC World Championship in 1996 with 291 points and placed fourth the following year. She was the Finnish DVG Working Vice-Champion for all breeds in 1993 and competed three times in the D.V. Meisterschaft. In 1997 Kleo became the FH Tracking Champion of D.V. Westfalen and placed third in the following year. Kleo passed the ZTP with 1A rating for character and SG for conformation in 1992 and tested clear for PHTVL / PHPV. She also passed the Finnish Körung. Kleo's brother, Ilo von der Weyermühle, passed the Erstkörung at 2 years of age with highest ratings for courage and working drives (very high protective instinct, fighting spirit and courage, high hardness and middle sharpness). Kleo lived to almost 13 years of age while her sire, Amor von der Weyermühle, lived to 12 years of age and her dam, Gina von der Weyermühle, passed away at 8½ years of age from cancer. Kleo's grand-dam, Cona von Niederkassel, lived to 14½ years of age. Between 1994 and 1999 Kleo worked as a Polizeidiensthund le Landes NWR for the German Police in Stukenbrook, Nordrhein-Westfalen. Due to her excellent nose, strong genes and solid nerve strength she was one of very few Dobermanns to have ever worked as a Police Identification Dog. Amatzon: SchH 3, FH 2, qualified SEK Polizeidiensthund and passed the ZTP with 1A rating for character and SG for conformation. He is sire of the von der Weyermühle “S” litter (Shannon, Snoopy); vom Merkureck “G” litter (Gini); vom Haus Weissenberger “J” litter (Jonas) and von der Urftquelle “C” litter (Curd, Cleo). Anke: SchH 2, SK 1. Brista: SchH 3, FH and passed the Erstkörung at two years of age with highest rating for hardness and working drives. 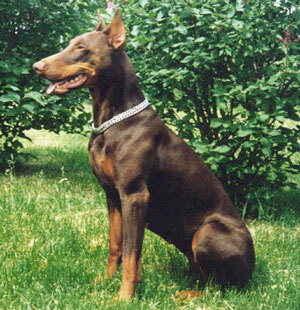 She is dam of the von der Burgstätte “A, B, C” litters (Aaron, Asco, Addy, Arno, Baghira, Brechi, Calle, Carla). Branca: SchH 3 and passed the Erstkörung at two years of age with highest rating for hardness and working drives. She is dam of the von der Drachenburg “A” litter (Aissil, Amica). Chico: BH, ADPr and sire of the von der Burgstätte “E, F, G” litters (Ernst, Esta, Gilla); vom Ferrenberg “H” litter (Heartbreaker) and vom Burgwald “P, Q” litters.